So I missed my window with last month’s Comic-Con, but there’s always something going on and thankfully the D23 Expo, a biennial Disney convention, this past weekend has given me a chance to take another stab at this topic. I’m too lazy put any effort into coming up with a pun involving plumbers, but today I’m going to be discussing leaks. To provide a little context, the screenshot up top is a tweet from Marvel Entertainment that was posted shortly after the trailer to Avengers: Age of Ultron leaked last October. Hours to minutes later they released the official trailer themselves, days earlier than originally intended. The second screenshot is the text that accompanied the full trailer to Warner Bros.’ Suicide Squad that was posted to the film’s Facebook page. It was penned by Sue Kroll, the President of Worldwide Marketing and International Distribution for the company. 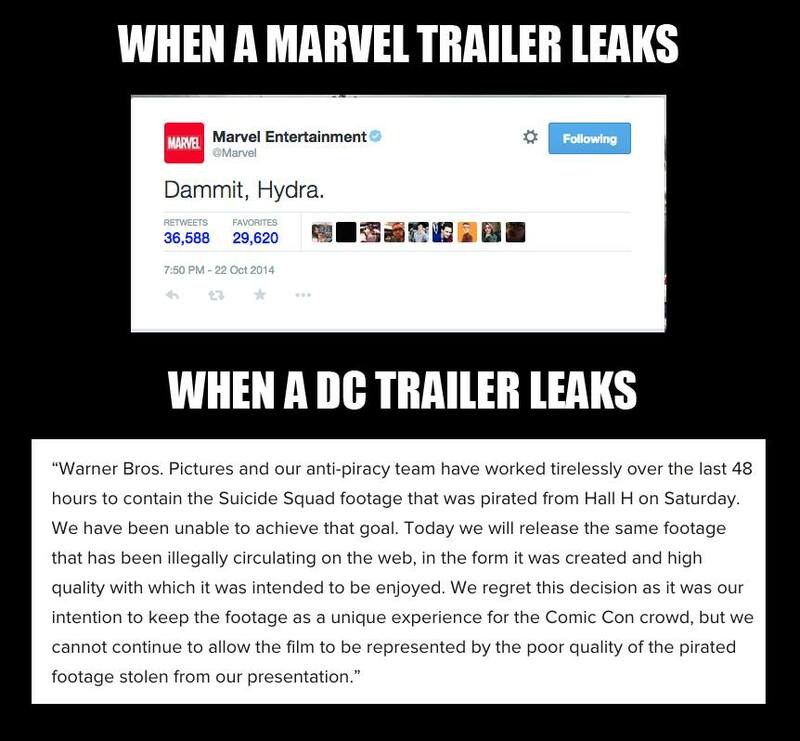 Similar to Marvel Entertainment this was done after another leak, though in this case the source was an unknown individual who had illegally recorded a trailer screened at Comic-Con. Tagged Avengers: Age of Ultron, comic books, Comic-Con, D23, dammit Hydra, deserve, entitled, exclusive, footage, harm, leaks, marketing, Marvel, rights, selfish, Suicide Squad, teaser, trailer, Warner Bros.